Delighted as I was by David Tennant in the festive episode of Doctor Who (Christmas Day BBC1), I'd like to offer him a little assistance. He said he wasn't sure what kind of man he is now, but the clues were all there. He spent most of his time in bed, oblivious to all appeals to get up and help. Whenever he opened his mouth, strange, inexplicable things came out of it; and when he finally did emerge after a cup of tea, he spent the day wandering around in his pyjamas. It's quite clear what kind of man you are, Doctor: you're a teenager. Mrs Kingston wins a portable digital radio: Pure's Evoke-2XT has radius-edged casework finished in either maple or cherry wood veneer, and a large, easy-to-read white-on-blue display. It retails for £149.99. Caption: Could the real name of new Doc David Tennant be Kevin? APA 6th ed. : (2006-01-14). Letter of the week. Radio Times p. 132. MLA 7th ed. : "Letter of the week." Radio Times [add city] 2006-01-14, 132. Print. Turabian: "Letter of the week." 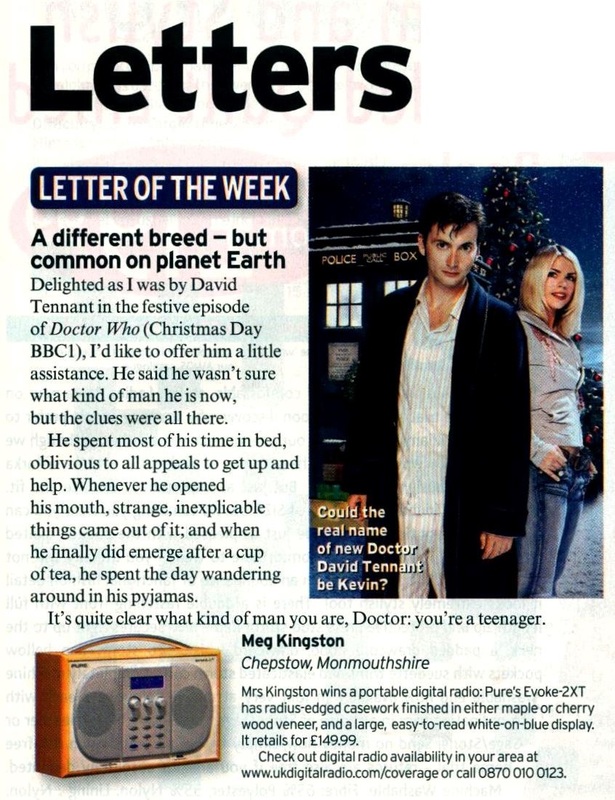 Radio Times, 2006-01-14, section, 132 edition. This page was last modified on 10 December 2015, at 23:43.